We’re proud to announce the newest version of mSecure, just in time for iOS 12. 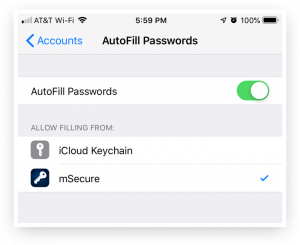 For those of you who keep up with Apple news on the web, you may have already heard about the new Password AutoFill feature in the new OS. 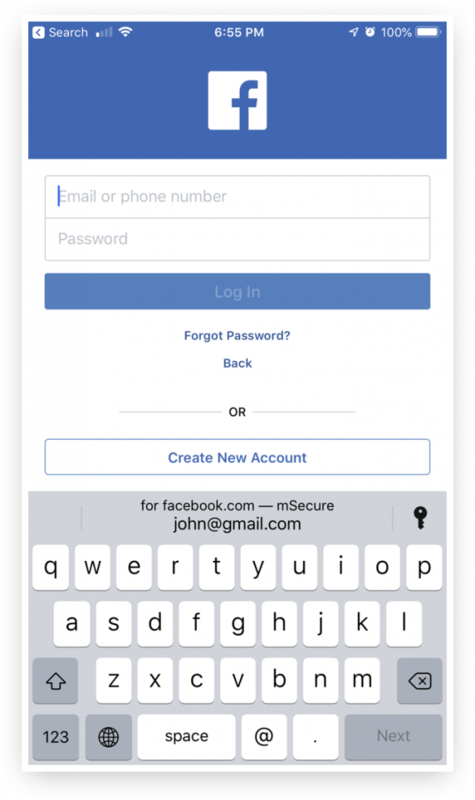 mSecure 5.6 supports this new iOS feature, which makes signing in to your accounts in apps and Safari easier than ever. The feature works in the same way using Safari, so there is nothing new to learn whether you are signing in to your favorite app installed on your phone or in to your bank account online in Safari. In either case, you will see the username for the Login stored in mSecure in the bar above the keyboard. Tap the username, and your ready to sign in! For more information on how this new feature works in mSecure 5.6, please view our support article. Anybody know how up upgrade from 5.5 to 5.6? Can't seem to find "Upgrade" link. Me 2 Mike - I can't find it ... it may be a way to limit the intiial rush of support problems. But it is 'odd' to advertise it and not say how/where to get it. The App Store should update mSecure 5 automatically to 5.6. mSecure 5.6 was released on last Monday (Sept. 17th) and is available for all. To manually check for updates in the App Store, open the App Store, tap updates, and tap and pull down to check for updates. You can also open and unlock mSecure 5, tap the menu, tap Settings, and select the About mSecure option to check the version of mSecure you have installed. Thanks. App Store Update worked! Firstly, thanks for getting this feature out so quickly! Great job. But can I ask, what does mSecure use to match a website or app login with an mSecure record? Is it the title of the record, the website URL or the username/password? Thank you. Thank you for contacting us, and I'm glad you like the quickness of our update! mSecure uses the record's URL to match websites and apps. Unfortunately, some apps will not have a website properly associated with it. However, we are working to fix that issue in the future. Note: our AutoFill feature requires that the record type you are using has a URL, Username, and Password field. The records don't have to have the 3 fields filled (though it will not work automatically without a URL). However, records will not appear at all in our AutoFill if they do not have the 3 required fields in the record type. Hi, my name is Fariba Lance and I reset my password but I cant get into my my phone using the reset password. Why?